A beautiful Rhode Island Locomotive Works builders plate. Click on the image for a larger version. Photo by permission. This article will concentrate on the ALCO (American Locomotive Company) predecessor plates as well as the plates from some of the other early builders. We will not go into great depth with the other early builders because of the scarcity of those plates. We have only had experience with plates we have seen or have in our personal collections. It must also be remembered that many of the early builders used very ornate "between-the-drivers" builders plates. These plates had a very short existence because of their vulnerable position on the locomotive. In the early corporate history of some of the builders, they did not use builders plates at all. It was only later in their corporate life that they began to use builders plates. There were eight major builders who merged into the American Locomotive Company in June of 1901. Later, two more -- Montreal and Rogers -- were added to ALCO making a total of ten. The least efficient plants were quickly closed out. This is why some of the ALCO standard 7" x 14" plates are difficult to locate from Dickson, Manchester, Rogers and Rhode Island. They were the first to be closed. By 1930, only the Schenectady plant in the U.S. and the Montreal plant in Canada were still producing locomotives. For our purposes, we will cover only plates that we know to still be in existence. It is recognized that almost all the builders made a number of versions or variations in the design of their plates. We have only seen some of the versions, and more are being discovered as research continues. Many of the early plates were lost to the scrapper's torch, especially during the Depression when many vintage locomotives of the late 1800's were cut up. Therefore, most of the plates we are identifying are of the time period 1890-1900. The photographs at the bottom of the page, where possible, show you the individual examples. 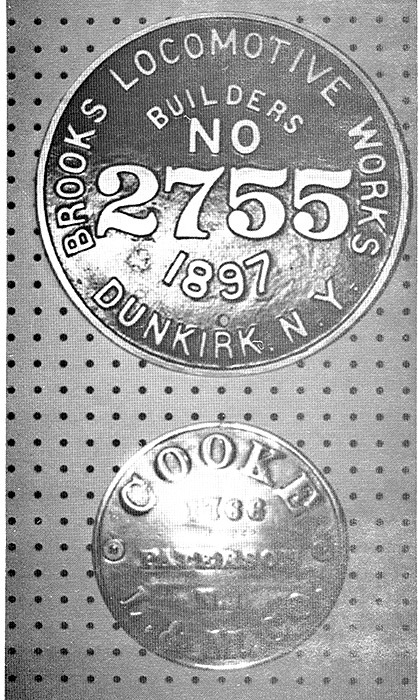 The Brooks Locomotive Works plates that we have seen are mammoth plates, both in size -- 13 3/4" round and weight -- heavy cast iron. The earlier 13" round plate is distinguished by letters and numbers that are relatively consistent in size. The later 13 3/4" round plate is very recognizable by larger letters and a very large construction number in the center. The later version Brooks plates always stand out clearly in the builders photos. It is believed that Brooks also used a 10" round plate and, in earlier years, a rectangle with dished corners like the Schenectady plates. A photo has been seen of a NYLE&W 4-4-0 #51 that had a Brooks rectangular plate. Brooks also occasionally used a "between-the-drivers" plate up until 1878-79. Unfortunately, the cast iron Brooks plates did not survive as well as some of the brass plates used by other builders. Fortunately for the collector, a number of the later version Brooks plates were saved because some locomotives were sold to Mexico and ran into the early 1960’s. Cooke evolved from the Danforth Cooke & Co. and later the Danforth Locomotive & Machine Co. The basic Cooke plate was a 9 1/2" round brass plate with all of the usual data except the date of manufacture was omitted. In later years, Cooke used the same plate but added the year of manufacture. The example we have of this plate is cast iron instead of brass. The typical round Cooke plate is usually a deep casting except for plates from passenger locomotives that have been worn down by polishing. A photograph of just such a plate is shown below from a C&O 4-4-0 #242. Note the wear on all the numbers and letters due to constant polishing over the years. A short duration 5" x 10 1/2" brass oval with indented lettering was also used after 1900. This style plate was used on both locomotives and rotary snowplows. The snowplow plates can be distinguished by a lack of construction number. 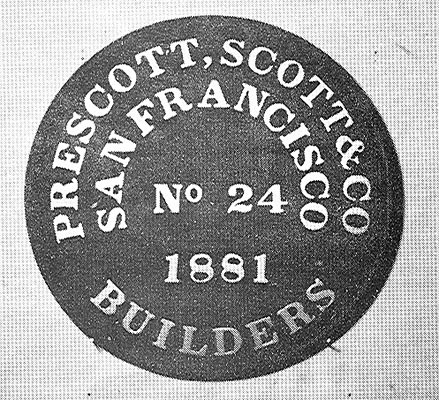 As near as we can ascertain, Dickson always employed a round builders plate. The early version was produced in both brass and cast iron and was 12 1/2” in diameter. Unfortunately, the casting was very thin which made them very fragile. To compensate for the smokebox diameter these plates were cast with a deep rim around the plate which was 1 1/2" deep at the top and bottom, and 1" at the sides. This 1/2" difference took care of the smokebox profile. 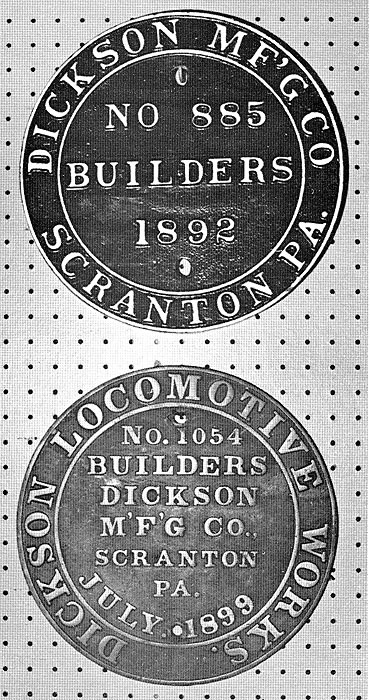 The later version plate has "Dickson Locomotive Works" cast around the edge of the plate instead of "Dickson Manufacturing Company". The "Dickson Manufacturing Company" was then cast in the center of the plate. The later version plates were brass and did not have the deep rim. They were merely bent to fit the curvature of the smokebox. The company retained the corporate name of "Dickson Manufacturing Company” throughout its life until merged with the ALCO group. All Dicksons are rare as they only produced about 1300 locomotives before the merger. Three of the best customers for Dickson were the on-line railroads in Scranton -- the DL&W, The D&H, and the NYO&W. Some of those plates must have survived! Manchester was a small New England builder. They produced some beautiful "between-the-drivers" plates up until the 1880 period. Unfortunately, we do not know of any that still exist. The earliest smokebox plate that we know of was used in 1883, around construction number 1144. This plate was a rather small brass oval, only 5" high and 10 1/4" long. Like a number of the early builders, the data was rather limited on the plate. Manchester did not cast in a construction number nor did they stamp it on the back like the early Rhode Island plates. This makes the exact identification of the locomotive limited to the year of construction. Prior to 1892, the ovals were a deeper casting compared to those we have seen from 1892 and later. By 1900, Manchester had finally placed a construction number on the same small oval plate without redesigning the balance of the plate. The 1900 version looks rather crowded and not symmetrical. 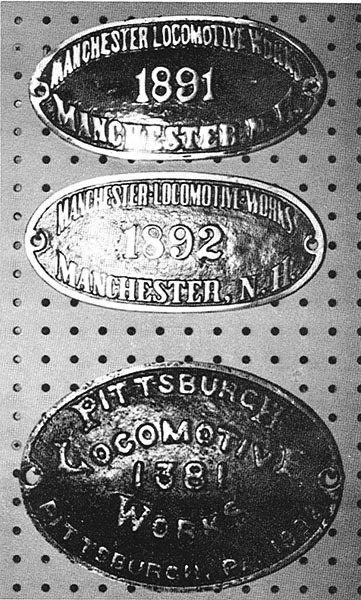 Manchester plates are rare because even though they built 1,793 locomotives, only the last 700 locomotives or so had smokebox builders plates. Pittsburgh was an old established builder that produced 2,400 locomotives between 1867 and 1901. For some unknown reason, the vast majority of the builders plates from Pittsburgh seem to have disappeared. It is believed that Pittsburgh used a round plate for a period of time, although we have never seen one. In the 1890's, the plant used two versions of plates. The first was a brass oval, 8" high and 11" long. The ovals are very rare, The second version was a large rectangle, 8" tall by 13 1/2" long. Although the plate was large, it was rather plain and unimaginative. These plates stand out on some of the large locomotives that Pittsburgh built around 1900. Pittsburgh built some of the largest locomotives in the world at that time. In the photograph below, please note the oval and look at the first and last letters of the words "Pittsburgh Locomotive Works" -- all first and last letters are capitalized. Pittsburgh followed some unorthodox practices with its plates over the years. This was continued when Pittsburgh was merged with ALCO in 1901. It was fashionable for a time to use " Pittsburgh " without the "H" and this is the way it appears on the 7" by 14" standard ALCO plates! 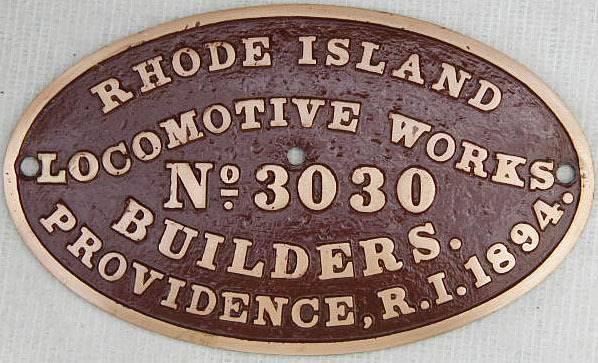 The Rhode Island Works were located in Providence, and they produced some of the finest "between-the-drivers" plates ever seen. Unfortunately, we have only seen these plates in photographs. Their smokebox plates followed suit and were some of the prettiest ever made. Three versions are known to exist. All are ovals, and the earliest has all the normal data except the construction number. This is similar to the early Manchester ovals. Fortunately, the construction number was stamped on the back side of the plate to help identify the locomotive. We refer to this as the "blind" version, and it was 8" tall by 13 1/2" long and was cast in brass. The second version was exactly the same size, but the construction number was cast in the center of the plate. This style of plate has the words "Locomotive Works" flowing up and down on the face of the plate which makes it quite attractive (See example at upper right of this page). After financial downturns at Rhode Island, the plant was closed down from 1896 to 1899. The last version Rhode Island plate reflects this change, from Rhode Island to International Power Company - Rhode Island Works. Logically, all this extra data required a larger brass oval, which was 10 1/4" tall by 15 1/2" long. All Rhode Island plates are difficult to locate. This is especially true for the International Power version which was only used on a few locomotives before Rhode island was absorbed into ALCO in 1901. Richmond was the largest locomotive builder in the South. They did not begin heavy locomotive production until 1883 when a larger plant was built and they started to compete with Baldwin and the other major builders. During the 1890’s, Richmond used both a round and later a diamond shaped plate. The round plate was about 10" in diameter and was cast in brass. It is an intricate and interesting plate and quite rare. The diamond plates were cast of brass in two versions. A fancy version and a plain version can be seen in the photographs below. Both versions were about the same size, 8 1/2" tall by 17 1/2" long. It is interesting to note that the fancy version included "Built By" on the face of the plate along with some winged-shaped designs and what appears to be a rising sun. 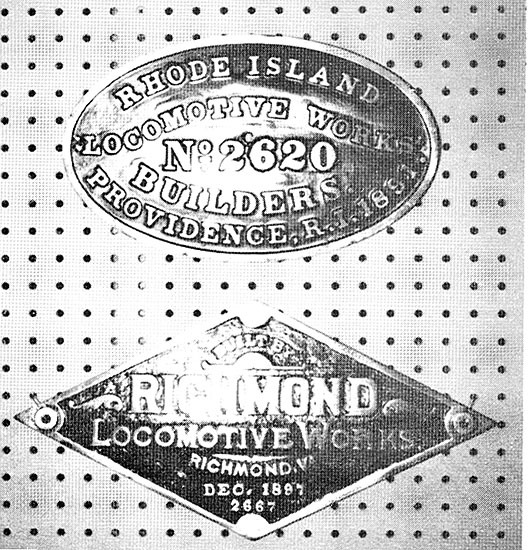 Richmond used their serial numbers on their marine and stationary engine construction as well as locomotives. Richmond's total locomotive production was about 1100. Baldwin, Norris, and Rogers were the original locomotive builders of any consequence. After Norris quit in 1866, Rogers held the number two spot behind Baldwin for many years. Rogers built their first locomotive in 1837. Rogers became the Rogers Locomotive & Machine Company in 1856 and used this title until 1893. 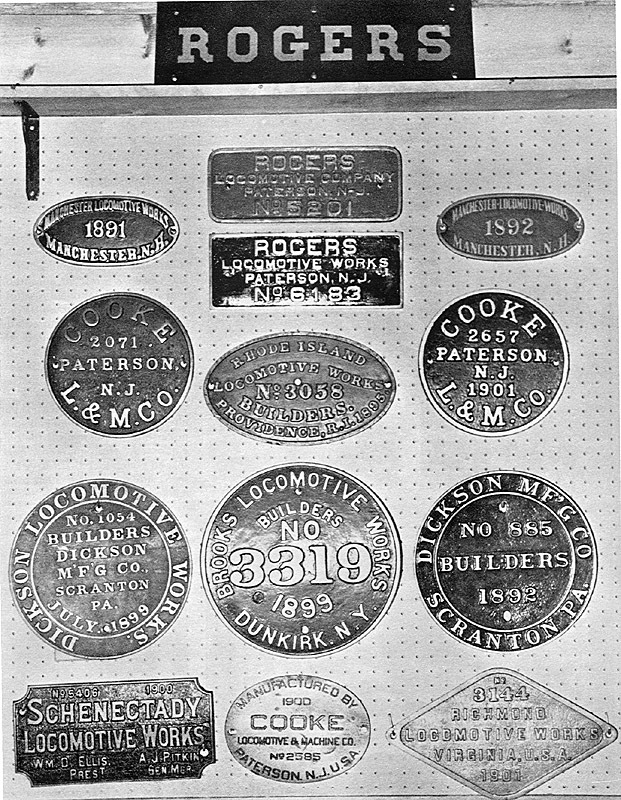 There are some builders plates in existence from the Rogers Locomotive & Machine Company, but they are far and few between. They used a brass rectangle with dished corners, very much like the Schenectady plate. In 1893, the company became the Rogers Locomotive Company. A photograph below shows this style plate, a 5 1/2" tall by 11 1/2" long brass rectangle with rounded corners. 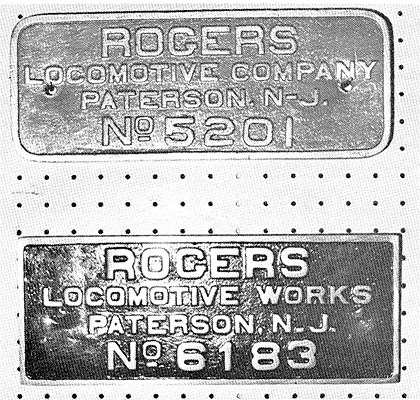 This style plate was used until 1901 when the corporate title was changed again, this time to the Rogers Locomotive Works. A similar brass rectangle was used; however, this time the plate had sharp corners and was used until 1904. The Rogers plates that we have seen are delicate brass castings with hollowed-out backs. This often results in damage around the bolt holes. The total locomotive production at Rogers was over 6000. Schenectady produced more locomotives than any of the other Pre-ALCO builders. They produced more than 6,000 locomotives at the time of the changeover to the American Locomotive Company in 1902. Schenectady also started later than many of the other builders, but they were determined and maintained a very progressive attitude along with a policy of continued re-tooling. Schenectady grew under the guidance of the Ellis family who had the foresight to hire excellent superintendents to run the business. 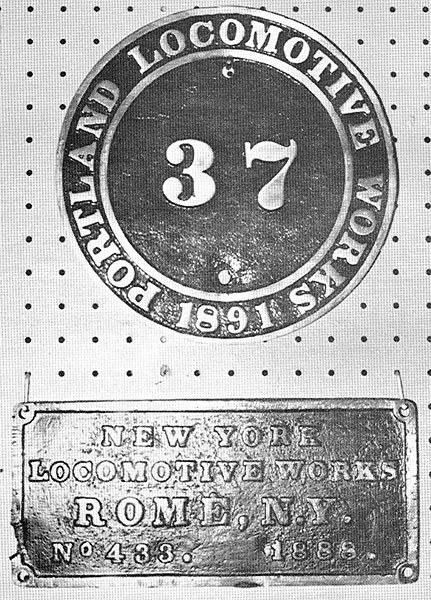 The first known Schenectady smokebox plate is #1338 produced in 1881. All of the Schenectady plates we have seen have been heavy, deep brass plates -- 7" high by 13 1/2" long in a rectangular shape with notched corners. Unlike some of the other Pre-ALCO builders, Schenectady plates carried more data! These plates included the names of the president and superintendent of the firm - that's really pride! 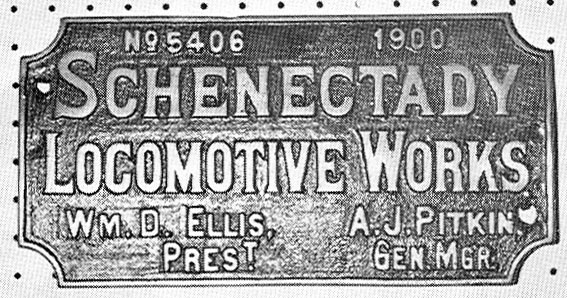 Although all pre-ALCO plates are rare, the Schenectady plates would be the most common because more of them survived. Schenectady used a heavy brass casting that seemed to survive the extreme travail of engine service. That concludes the nine builders who merged to form the American Locomotive Company. While Montreal was included in the ALCO group at a later date, they were not in business prior to 1900, so we will cover the Montreal Locomotive & Machine Company and the subsequent Montreal Locomotive Works when we look at the ALCO series in the next article. Let us now look back at some of the smaller builders who did not make it into the twentieth century although some of their builders plates did. Mason Machine Works was basically a builder of textile machinery, and they built locomotives as a second line. Mason built locomotives from 1853 to 1889. Masons became widely known as well-made and handsome locomotives. 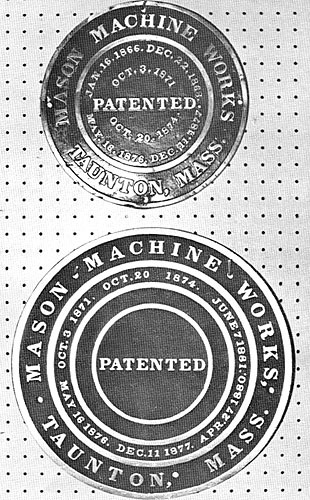 Mason employed a number of different builders plates. They first used a very elaborate "between-the-drivers" plate. Later they used a steam chest plate, then both small and large versions of a rectangular plate. We are only familiar with the 12" diameter and 16" diameter round brass plates. A photo below shows both of these plates. Mason plates are difficult to pinpoint as they did not use shop numbers on their plates. Total production at Mason was around 754 locomotives. The New York Locomotive Works was organized in 1881 and produced locomotives from 1882 to about 1892. Although they only were in business for 10 years, they produced nearly 700 locomotives. This is quite impressive for a newcomer to the business. We know that New York used two different style rectangular plates. Most locomotives had a 5 3/8" x 11 13/16" brass rectangle with four bolt holes. We understand that towards the end of production another brass rectangle was used with only two bolt holes. The Portland Company built locomotives mostly for early Canadian railroads. They used a plate affixed to the base of the steam dome along with a “between-the-drivers” plate that had a serial number. In later years, Portland apparently used two sizes of round brass plates. They used 6 1/2" diameter brass plates on some of the locomotives that they built for the Maine two foot gauge railroads. An example of a small Portland plate is shown in a photograph below along with a photograph of a 10" diameter plate. The 10" round brass plate was used on a Leslie Snowplow, RGS #2. 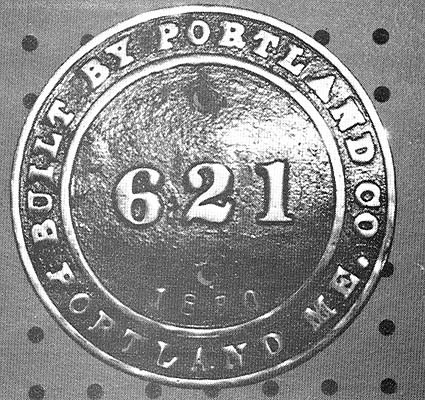 Any Portland plate is rare as the company built only 628 locomotives between 1848 and 1906. We wish there were more early plates that made it into collectors’ hands. We will have to forget Norris, Hinkley, Grant, and Taunton They were all major builders, but we do not have access to their plates. Of the four companies, only Grant and Hinkley still manufactured locomotives in the early 1890’s, and neither Grant nor Hinkley were in business in 1900! We do know of two Grant plates -- both rectangles of moderate size made of brass that are in individual collections. They were from rotary snowplows, but we do not have any photos to show. And, of course, there are stories that circulate -- one in particular is about a Hinkley plate, a "between-the-drivers style" -- but this is a story that has been passed from collector to collector, and we do not have the source. Oh yes, there is one Norris plate, and it was sold to a gentleman from Canada in the 1972 Penn Central auction. It was a very early plate, say around 1856(? ), but it now is north of the border and apparently involved in an estate settlement. We have also seen a Taunton equipment plate, but never one from a locomotive. Being eternal optimists, we are sure that somebody has one somewhere! Any information is welcomed. Email us. Shown below are various plates described in this article. Click on the images for larger versions. Use you BACK button to return to the page. Some of the bigger images are very large files so download time will be s-l-o-w on a modem connection. Far left. 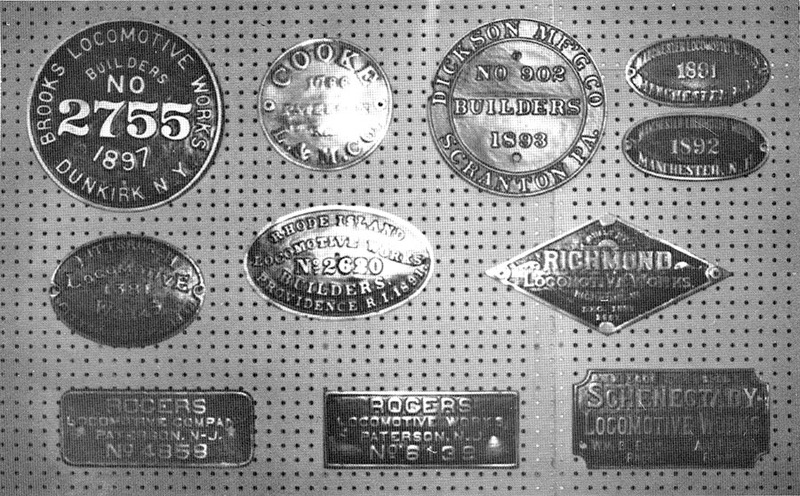 A display of pre-ALCO plates. The Rogers plate on top is an identification plate that was mounted on the cylinders. Middle Left. Shown above are plates from the nine pre-ALCO builders and are all brass except the Brooks and Dickson. Middle Right. Brooks - CN 27551 was a Mexican Central 4-6-0 #177. Plate is 14" in diameter - cast iron. Cooke - CN 1766 was built in 1877 -- off C&O American #242. Note how plate has been "polished down". Far Right. Three versions of Cooke plates. The #2071 is from UP 4-6-0 #1465 built in 1891. The #2585 is from SP 4-4-0 #1457; this was a very short duration plate. The #2657 is from I&GN 4-6-0 #206. Far left. Photo showing difference in size and method of accomodating the boiler profile. The Cooke is 9 1/2" while the Dickson is 12" in diameter. Middle Left. Two versions of Dickson plates. The #885 is from NYO&W 2-8-OCB #178 and is cast iron. The #1054 is from AT&SF 2-8-0 #727 and is brass. Middle Right. Manchester and Pittsburgh plates. Note the style difference between the 1891 & 1892 Manchesters. Also the capitalization of the first and last letters on the Pittsburgh. Far Right. Rhode Island #3058 is from NYNH&H 2-8-0 #297. Richmond #3144 is from RF&P 4-6-0 #34. This version Richmond is much plainer than the earlier version. Far left. 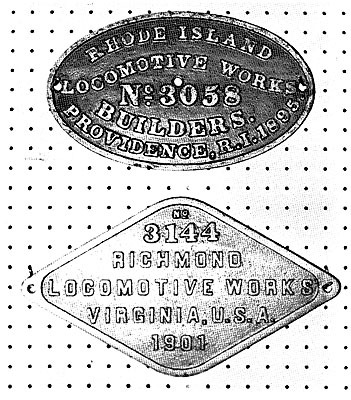 Rhode Island oval - #2620 - 1891 from a named engine -the "George D. Webb" on the Ad&St.L&W. The engine was an 0-6-0. Fancy Richmond #2667 off a C&O 2-8-0 #690. Middle Left. Two versions of Rogers plates. The #5201 is from Mobile & Ohio 4-6-0 #123. The #6183 is from IC 2-8-0 #769. Both plates are brass. Middle Right. Schenectady #5406 is from Rutland 2-6-0 #150 that was scrapped in 1940. Note the President's and General Manager's names! Far Right. Two versions of Mason plates. The 12" diameter plate is from a DSP&P 2-6-6T built in 1879. The 16" diameter plate is from Calumet & Hecla 0-6-4T #8 or #9 built in 1887. Left. The Portland #37 is from RGS Snowplow #2. This is the 10" diameter plate. The New York Locomotive Works #433 is from UP 2-8-0 #704 built in 1888. Middle. Portland Co. #621-1890 is from Kennebec Central Forney #2. The plate is 6" in diameter. Right. Prescott, Scott & Company #241881 from Bodie & Benton 2-6-0. One of the last locomotives built by the firm. Web Editor's note: This article was originally published in a 1983 issue of Key, Lock & Lantern and has been slightly edited for the web. A special thanks to Tim Moore and Ron Muldowney for their generous permission to reprint it here.